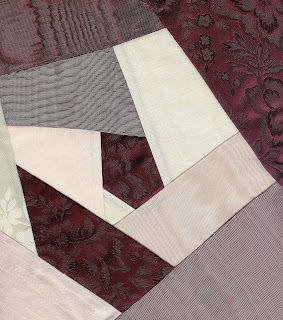 I am back with new squares for the 2010 MCC Quilt we are making. 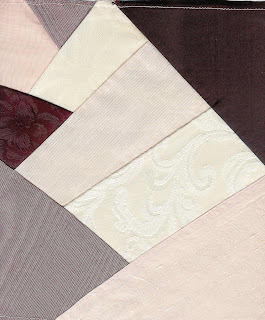 This year we a going to make a Valentine Theme Crazy Quilt. 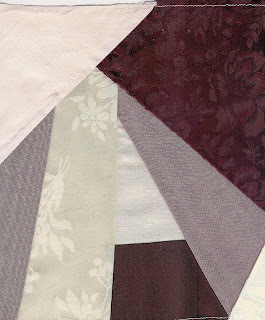 This quilt is inspired by Miss Carole Samples herself! The quilt for 2009 was auctioned off on April 18 and it sold for $1,700. A member of our round robin group that helped make the quilt purchased it. We know that it is at a home where it will be taken care of and treasured! The new square are pictured here. The burgundy reds kind of scan dark, they really are a pretty burgundy.